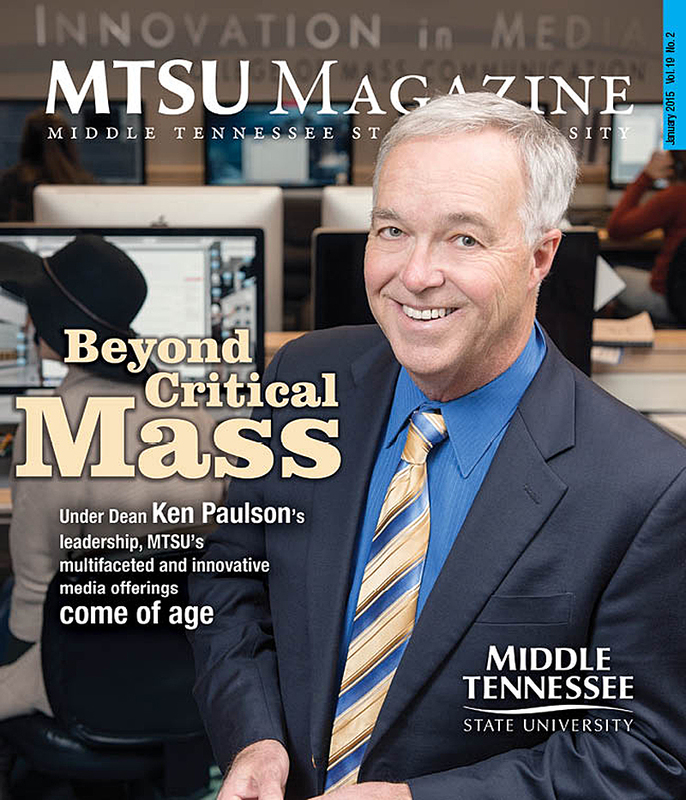 College of Mass Communication Dean Ken Paulson was featured in the Winter 2015 Edition of the MTSU Magazine. The featured article, “Beyond Critical Mass,” highlighted the college’s strengths and Paulson’s vision for the future. Mass Comm is the only college in the nation that houses three unique programs in the Recording Industry, Journalism and Electronic Media concentrations. The college also boasts the John Seigenthaler Chair of Excellence in First Amendment Studies, The Center for Popular Music and the Center for Innovation in Media, a nationally-recognized multimedia facility that features two radio stations, a student-run newspaper and a student-run record label. Paulson is a former editor-in-chief of USA TODAY and is the current CEO of the First Amendment Center in Nashville, Tennessee. He came on board as the college’s dean in 2013 and knew the college needed retooling. This includes a strategic shift that will meld the college’s two aforementioned journalism programs — the School of Journalism’s traditional program, for print, and the Department of Electronic Media Communication’s multimedia program for practically everything else — into a single, vibrant, multiplatform program poised for roll out in the fall of 2015. From a curriculum perspective, it’s a savvy shift in approach by the college that better reflects the media industry students will enter after graduation. Readers may download MTSU Magazine free for their iPads and Android devices. The MTSU Mag app, available in the iTunes store and now at Google Play, includes special multimedia content built into every issue that’s not available in the print editions. Printed copies of MTSU Magazine are distributed twice annually to more than 105,000 alumni readers. The publication also is distributed to interested community members, including state lawmakers and members of the Tennessee Board of Regents. To read MTSU Magazine online, please click here: www.mtsumagazine.com.